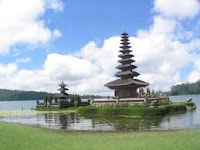 The annual monsoon transforms Bali. Rain sweeps across slumbering volcanoes. Moss thickens on ancient temple walls. Rivers swell and flush their trash and frothing human waste into the sea off Kuta Beach, the island's most famous tourist attraction, where bacteria bloom and the water turns muddy with dead plankton. "It happens every year," shrugs Wayan Sumerta, a Kuta lifeguard, who sits with his love-struck Japanese girlfriend amid dunes of surf-tossed garbage. So why, in early March, did the Bali authorities warn tourists that swimming there for over 30 minutes could cause skin infections? The lifeguard tenderly strokes his girlfriend's naked leg. "I guess some people just have sensitive skin," he says. Most of Bali's woes stem from a problem that rival resorts would love to have: too many tourists. In 2001, the island welcomed about 1.3 million foreign visitors. Ten years later — and despite bombings by Islamic extremists in 2002 and 2005 that killed 222 people, mostly Australian tourists — the island expects almost twice that number. And there are millions of Indonesian visitors too. When it comes to Bali, newspaper editors have a seemingly bottomless stock of "Paradise Lost?" headlines. Its rich Hindu culture is so distinctive that many people mistake the island for a separate country rather than a province of the world's most populous Muslim nation. That Bali's tourism industry has survived terrorism attacks and a global recession is a cause for pride. But amid unchecked growth and a creaking infrastructure, it is also a source of complacency. "It's like Bali is slowly committing suicide," says local journalist Wayan Juniarta. Bali's Governor I Made Mangku Pastika knows it. In January, he issued a moratorium on new construction in certain built-up areas, and later warned that his lush birthplace might turn into a "dry land full of concrete buildings." Pastika is popular — he investigated the bombings as Bali's then police chief — but his moratorium isn't. "Some people says he's trying to slow down Bali's growth," says Nomura. "That's not necessarily true. What he's looking for is more responsible growth." He probably won't find it. Nobody I talked to reckoned that Pastika's measures would influence who built what where. Bali's spiritualism might be a bewildering blend of Hinduism, Buddhism and animism, but the island's planning code is simple: if you build it, they will come. And on the way, they'll get stuck in traffic. Complaining about the congestion around the airport or in tourist areas like Kuta is now one of Bali's newest pastimes. Even in Ubud, the seat of the island's art and culture, once sleepy streets are clogged with buses carrying Chinese tourists, who visit the island in ever greater numbers. Vehicle ownership on Bali is rising at an annual rate (12.42%) that far outstrips the growth in new roads (2.28%), according to government statistics. "Traffic will get worse and worse," I Made Santha, Bali's traffic chief, predicted in February. Equally damaging to Bali's prestige is the perception among some expatriates that the island is increasingly unsafe. Lusiana Burgess, the 46-year-old Indonesian wife of a retired British pilot, was robbed and killed in her North Kuta home earlier this year and her murderer remains at large. An Australian woman awoke in her villa to be gagged and assaulted by four thieves. Then an American man was stabbed during another robbery attempt in Kuta. A week after that, police arrested and — following an apparent escape attempt — shot dead 34-year-old M. Syahri, from the neighboring island of Lombok, who was suspected of robbing a number of foreigners. The statistics actually show a slight decrease in serious crime from 2009 to '10. But Chris Wilkin, a former oil-company executive from the U.K. who retired in Bali six years ago, remains uneasy. "It was very quiet when I moved here," he says. "It wasn't a big attraction for the criminal classes. Now, with the boom, word has got round that there are easy pickings to be had." Expat anxiety hasn't dented Bali's popularity among its core visitors, the Australians. And why should it? Officially, the Australian government still advises its citizens to "reconsider your need to travel" to Bali due to a "very high threat of terrorist attack," yet more than a hundred flights arrive from Australia every week. The dangers to new arrivals are those commonly faced by tourists everywhere: dodgy food, motorbike accidents, and — as a sign at my Kuta hotel suggests ("No Jumping from Any Balcony into Pool Is Permitted") — beer-fueled misadventure. Wah kok negatif begitu. semoga pariwisata bali dan indonesia terus maju dan makin mendunia. kritik semacam ini perlu dijadikan sbg bahan refleksi bagi pengelola wisata di pulau dewata itu, mas pencerah. sbg tujuan wisata internasional, bali memang sdh saatnya menyiapkan berbagai infrastruktur penunjangnya. semoga ini bisa membuat kita semua intropeksi diri kalau memang fakta ya harus dibenahi sehingga ke depan menjadi lebih baik. hope this will make all of us self introspection, if there is a fact, we have to make it good and so next it will better. mangdane semeton bali samian mulat sarira, yening nike patut, ngiring ngemargian sane becik, mangdane pariwisate bali ngancan mecikan. Bali memang tempat wisata yang paling bagus, buktinya turis-turis yang datang kesini semuanya pada senang dan malahan mau bertempat tinggal juga disini. jadi bali itu pilihan yang pas buat semuanya berlibur :d.
Terima kasih iya sudah di perkenankan komen salam kenal. How About Libya Today ? alhamdulillah sekarang udah disikat abis..
apalagi ya yg perlu disorot? Saya sangat setuju dengan komentar yang menyatakan bahwa ini adalah cara lain dari orang lain untuk peduli dengan Bali. dan Harapan kita tentu adalah sebuah respon langsung terhadap kritikan tersebut, tidak perlu kita emosi terhadap artikel tersebut atau membalas menyerang, karena impact nya akan kontraproduktif dengan apa yang memang sebenarnya terjadi. Perlu kita garis bawahi, Bali pada 2000 sudah memiliki populitas 3,5 juta jiwa, dan pada 2010 jumlah sudah diperkirakan meningkat menjadi 5,5 Juta.atau peningkatan hampir sekitar 75%. Jumlah yang sangat padat untuk pulau sekecil Bali. Tidak heran peningkatan jumlah kendaraan di Bali yang secara annual meningkat 12,8% membuat kemacetan dimana-mana. Populasi yang padat membuat sanitasi air begitu buruk. Jika boleh kita introspeksi, sudah seharusnya pemerintah lebih berani melindungi Bali sebagai aset bangsa ini, pemerintah harus berada dalam posisi yang melihat bahwa Bali saat ini sudah over capacity, dan tidak kuat lagi menampung lebih banyak populasi. Jika memaksakan Bali terus dijejali manusia, maka artikel-artikel serupa tentu akan terus tercipta di tahun-tahun mendatang. Mozilla Firefox se niega a colaborar con la censura en la Red impuesta por EEUU - Mozilla, la organización responsable del navegador Firefox, ha decidido plantar cara a las autoridades de Estados Unidos. Mientras éstas le solicitaban la retirada de una extensión que permite acceder a páginas web bloqueadas por uno de sus departamentos de seguridad, los responsables del navegador han respondido con un "no" rotundo a esta posibilidad. waduh gak kebayang karena blm pernah kesana.. kapan ya bisa berlibur ke bali..